Aging is one of life’s most predictable events, yet exploring this subject is too often absent from personal and professional conversations because speaking about aging and the end of life often awakens the reality of mortality and debilitation. Also, social attitudes can sometimes work to devalue, disregard, and ultimately silence the aging experience, leaving older adults feeling diminished and isolated. But the stereotypes of older adults being unattractive, wrinkled, impaired, disinterested, disgruntled, and one step away from death can be reversed or reframed. The elder years can be compatible with vibrancy, with late life still being full of continued productivity, connectedness, emotional resilience, and wisdom. The face of aging is changing, with many older adults living longer and healthier lives. This shift is impacting how society views elders and how elders view themselves. Elders watch public figures such as Bill Clinton, Regis Philbin, and Barbara Walters face serious health problems, survive them, and go on to continue successful careers. In the past, such age-related health issues would likely have prevented elders from living vibrant, independent lives. Although these results inspire optimism, how will these changes affect the average older adult’s view of themselves? No one can better redefine the aging experience than older adults themselves—the real experts. Older adults can replace previous stereotypes with their own realistic experience-based description of what matters to them now. This optimism inspired the development of an original mental health intervention for typical problems of aging for elders over the age of 70. In 2007, I formed a free monthly group for elders to talk. Members have varying education levels, finances, health, marital status, genders, and independence. The current ages of the group members range from 76 to 88. The group is based on a topic-centered questionnaire for facilitators that was developed over five years’ worth of group meetings. Each topic contains questions related to central issues about the aging experience. The topics are formidable, eliciting reflective, meaningful responses. Members have enthusiastically endorsed this questionnaire-based method because it has helped them feel that their definition of their life experiences is being taken seriously. They also feel that having a leader/facilitator is necessary for focus. The group mood has been dedicated, eager, and committed. The members are wading into deep emotional territory: illness, regrets, lost opportunities, family disputes, sexuality, and death. The group has covered topics such as surviving the rigors imposed by aging; recognizing, accepting, and managing diminished health and functioning; figuring out when and how to ask for help as well as indicating to others when independent functioning is possible; realizing how perspective changes when one realizes that life is limited; examining feelings about planning for the end of life; investigating new interests and opportunities dealing assertively with healthcare professionals, sales people, and youths; and reviewing their earlier lives, struggles, and successes. • Do you feel your age? • What makes you feel necessary and vibrant? • What does it take to adapt to the inevitable transitions that aging requires? • Does your stage of life affect the way people react to you? • Have you needed to curtail certain activities due to decreased energy or health problems? • Do you feel recognized, regarded, useful, and necessary now? Older adults do not typically feel comfortable seeking mental health treatment. People in their late 70s and 80s were raised at a time when talk therapy to improve mental health was unheard of. Such conversations were kept within the family. Therefore, elders can feel a stigma attached to talking about serious subjects with others. A peer group such as this one, different from bridge and bingo, can provoke initial reluctance. It may be the first time elders reveal thoughts, attitudes, and memories that are important to them. Having others listen to, understand, and respect their thoughts can be a novel experience. Bearing witness to peers talking about similar life struggles eases the transition into talking. Painful topics do come up in a group. Members fear they may not be around to experience important life events. They are apprehensive about possibly needing more help as they age. They are dismayed if they have an extended recovery from illness. Unearthing these thoughts can leave them feeling disheartened, disturbed, and disappointed. As the group members gradually become aware of the consequences of aging, they begin opening up to talking and listening to this type of discussion. The group setting among people at this stage of life eases the pain and disappointment and diminishes the amount of discomfort involved. It gradually works to immunize people to their initial trepidations. As the group progresses, the members appreciate being taken seriously and being accepted, admired, liked, and included. The social interaction provides them with validation, empathy, and support in a congenial environment. The inevitable risks and hazards of aging become apparent. This helps older adults become more realistic when adopting coping skills for the future. Considering serious topics and discussing them exercises the mind, moves individuals from one stage to another in life, and reaffirms a sense of personal identity. This model can be further researched and duplicated. A group like this can be run by a social worker in an older adult inpatient or outpatient facility. It can be adapted for use in libraries, adult education programs, and private practices. 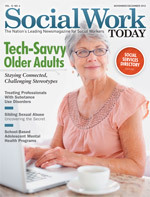 Social workers can train and supervise older adults who have been in a group like this to run informal elder peer groups. The questionnaires can be used as part of an aging sequence in a university curriculum or a social work program. — Wendy A. Wilson, LCSW, who has practiced psychotherapy for 35 years, was an adjunct faculty member at Adelphi University School of Social Work in Garden City, NY, and is a national presenter on issues facing older adults.